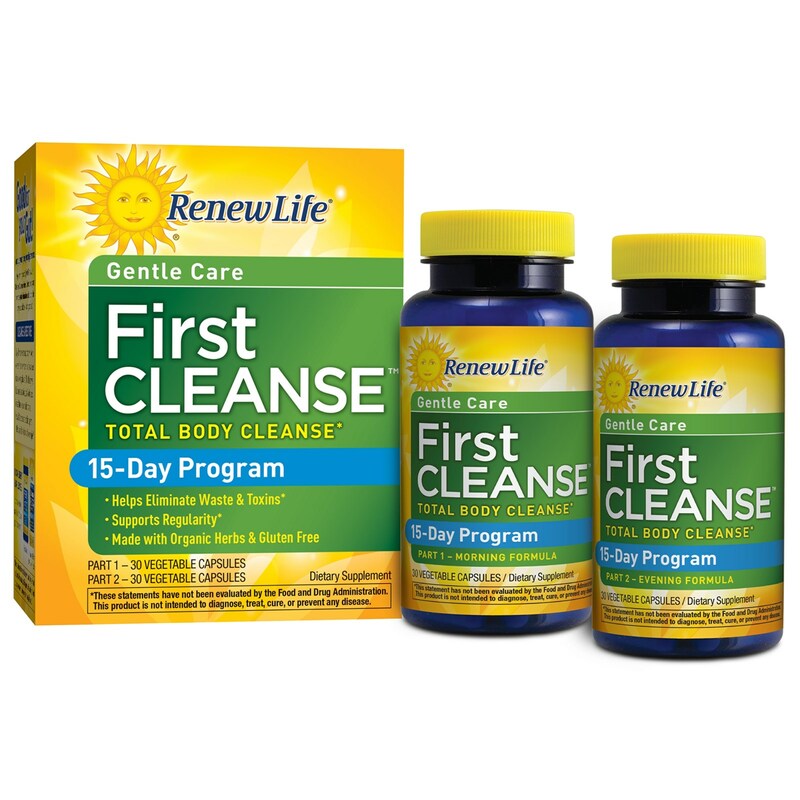 Renew Life Gentle Cleansing Programs are wholesome, herbal formulas to help you get rid of digestive toxins and support regularity. They provide targeted support to the body's pathways of elimination: liver, lungs, lymphatic system, kidneys, skin, blood, and bowel. 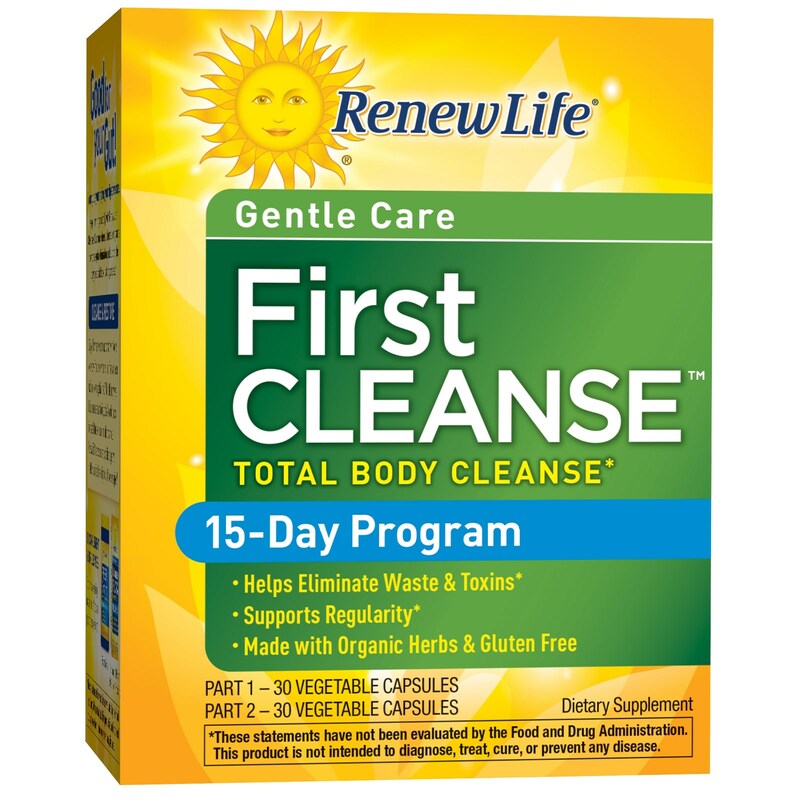 First Cleanse is an easy and effective two-part program ideal for those who are new to cleansing or just want a more gentle cleansing experience. 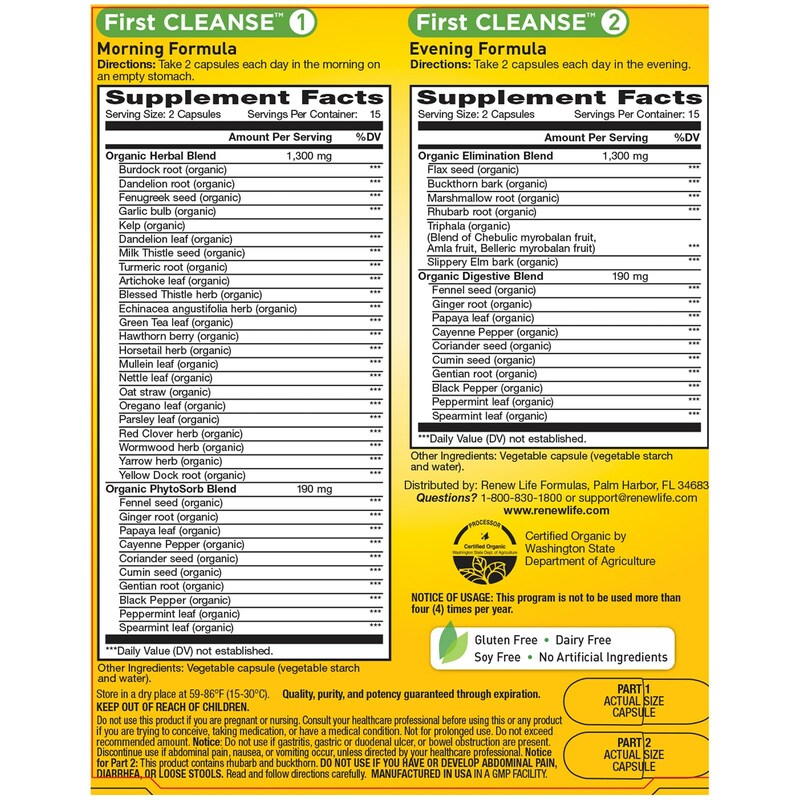 The morning cleanse supports detoxification; the evening cleanse promotes elimination. Keep it running smoothly with Renew Life Cleanses. Our comprehensive herbal programs promote regular elimination and support the body's natural detoxification process. Did you know that we come in contact with toxins every day - from the environment, our food, and even within our own digestive tract? While the body was built to process these toxins, today's world places increased stress on our elimination channels. Renew Life Cleansers help re-establish digestive health so you feel better, lighter, and more energized. For optimal cleansing results, add a fiber and probiotic supplement. Morning Formula - Take 2 capsules each day in the morning on an empty stomach. Evening Formula - Take 2 capsules each day in the evening. Vegetable capsule (vegetable starch and water). Prop 65 Warning: This product contains a chemical known to the State of California to cause birth defects or other reproductive harm. Tamper Evident: Do not use if either the outer neck band or the inner seal on bottles is broken or missing. Notice of Usage: This program is not to be used more than four (4) times per year. Store in a dry place at 59-86°F (15-30°C). Do not use this product if you are pregnant or nursing. Consult your healthcare professional before using this or any product if you are trying to conceive, taking medication or have a medical condition. Not for prolonged use. Do not exceed recommended amount. Notice: Do not use if gastritis, gastric or duodenal ulcer, or bowel obstruction are present. Discontinue use if abdominal pain, nausea, or vomiting occur, unless directed by your healthcare professional. Notice for Part 2: This product contains rhubarb and buckthorn. Do not use if you have or develop abdominal pain, diarrhea, or loose stools. Read and follow directions carefully. Manufactured in USA in a GMP facility.